This is far from the first time that the BBC (and specifically Yolande Knell) has inaccurately told its audiences that Gaza’s electricity supply problems – which predate this conflict by a long time – are the result of Israeli border restrictions and it would appear that the BBC is beginning to believe its own spin. In fact – like the shortage of medical supplies which Yolande Knell and others have also inaccurately attributed to Israeli policy – the fuel shortage in the Gaza Strip is the product of disputes between Hamas and the Palestinian Authority. Knell fails to inform viewers that throughout the entire recent conflict – and of course before it – fuel of various kinds has continued to enter the Gaza Strip via the Kerem Shalom crossing, including 4.44 million liters of fuel for Gaza’s power plant. Knell’s report then returns to the Gaza power plant manager who gives BBC viewers the mistaken impression that Gaza’s entire electricity supply depends upon his establishment. In fact, of course, the Gaza Strip has two additional sources of power. Egypt supplies some 27 megawatts on a regular basis and recently increased that supply by a further 7 megawatts in light of the current power crisis in Gaza. In line with the terms of the Oslo Accords, Israel continues to supply the Gaza Strip with 120 megawatts and although several instances of power supply lines being damaged by terrorist missile fire occurred during Operation Protective Edge (unreported by the BBC), those lines were repaired by the Israel Electric Corporation. Coincidentally, the debt owed to Israel’s electric company by the Gaza Strip stands at around 220 million shekels. After an interview with members of a family in Beit Lahiya, Knell moves on to the topic of water and sewage. Despite her descriptions of damage caused during Israel’s ground operation, she fails to mention that Hamas refused a ceasefire two days before that operation commenced. Knell then interviews the director of Shifa hospital, but predictably refrains from popping down to that hospital’s basement to ask the Hamas leaders ensconced there for well over a month about their years of neglect of Gaza’s infrastructure, their short-sighted policy decisions which have left the civilian population without sufficient electricity supplies and their diversion of concrete, piping and other materials which could have been used to improve Gaza’s neglected utilities to terrorism. 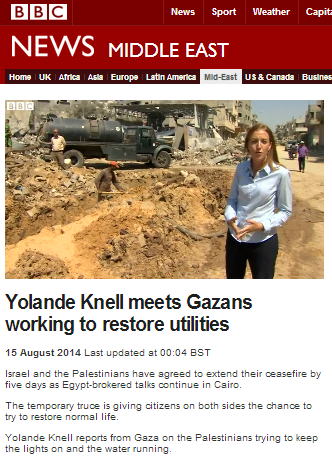 Of course the real aim of Knell’s report is not to inform BBC viewers why Gaza’s infrastructure is so badly neglected. Her entire report is in fact yet another contribution to the BBC’s ongoing advocacy campaign for Hamas demands concerning the lifting of border restrictions – as can be seen in her conclusion. An accurate and impartial report on this issue would have to include the provision of information to audiences as to why the demand to “open up Gaza’s borders” is precisely one of the “security concerns” which now need to be addressed. As is the case with all other BBC reports on this topic, weapons smuggling, the rearming of terrorist groups and well over a decade of terrorism from the Gaza Strip are not included on the menu. I used to only rarely watch BBC news. But with Fox News’ lack of coverage of the Gaza war, I started surfing BBC News and even Al Jazeera for latest news; being fully aware of the predjudgism of those channels. However, I was still surprised by Yolande Knell’s reports which I found to be pure Hamas propaganda.